Para gamer penggemar game bola Pro Evolution Soccer 2018 khususnya untuk pengguna Playstation 3 CFW sudah selayaknya berterima kasih sebanyak-banyaknya kepada para patch maker PES 2018, dimana selain kita bisa menikmati PES 2018 secara gratis dengan banyak pilihan update-update terbarunya. 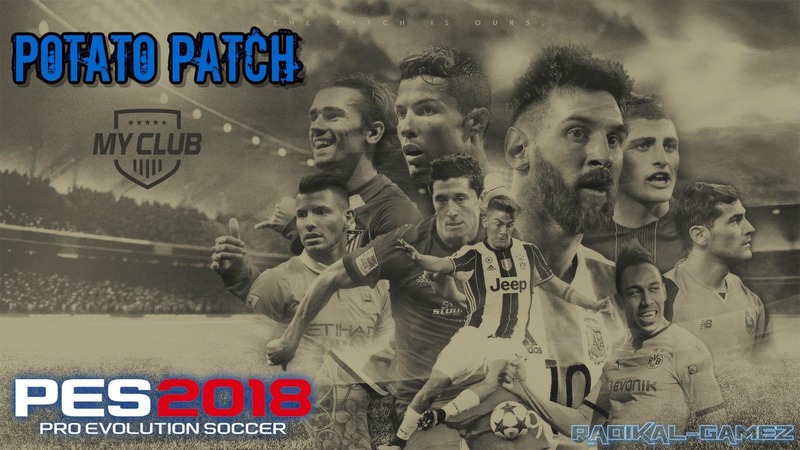 Update patch PES 2018 PS3 kali ini dari Potato Patch, jika sebelumnya sudah di posting PES 2018 PS3 Potato Patch for BLES and BLUS kemudian update terbaru Potato Patch V1 PES 2018 BLES + BLUS. ⚽ Update files updated with Live Update 24-9-17 (Thanks to @ DR77). ⚽ Correct logos for all competitions. ⚽ Correct logos for all teams. ⚽ Correct kits for Premier League, Serie A, Serie B, LaLiga Santander and LaLiga 1 | 2 | 3, League NOS and Skybet Championship. ⚽ Superliga Argentina: Added Argentines Jrs and Chacarita Jrs with correct Kits. Kits improved in quality and in some cases replaced by true ones (adapted from PS4 to PS3 by me) – Added 4th Kit for Mouth and 3rd Kit for River. ⚽ Edited Bayern Munich: Minifaces, Kits, Logos and Real Formation – 5 Real Faces applied (Coman, Ribery, Ulreich, Rafinha and Bernat) By Maestro Poltergeist and editemospes. ⚽ Diego Maradona and Usain Bolt as free agents to use in LM and Become a Legend modes (Extracted from MyClub and adapted by me). International Champions Cup Singapore – Konami League and Konami Cup replaced by Conc acaf League and International Champions Cup. ⚽ AlexVegas Stadium Pack – 40 Stadiums in total (Anfield Road, Morelos, Centennial, Etihad Stadium, Singal Iduna Park, Stamford Brige, Heart Line, Maracaná etc.) with Adboards, Pitch and Turf HD. ⚽ Brasileirão: Correct players for all teams. ⚽ Bundesliga, MX League and J-League are still under construction.